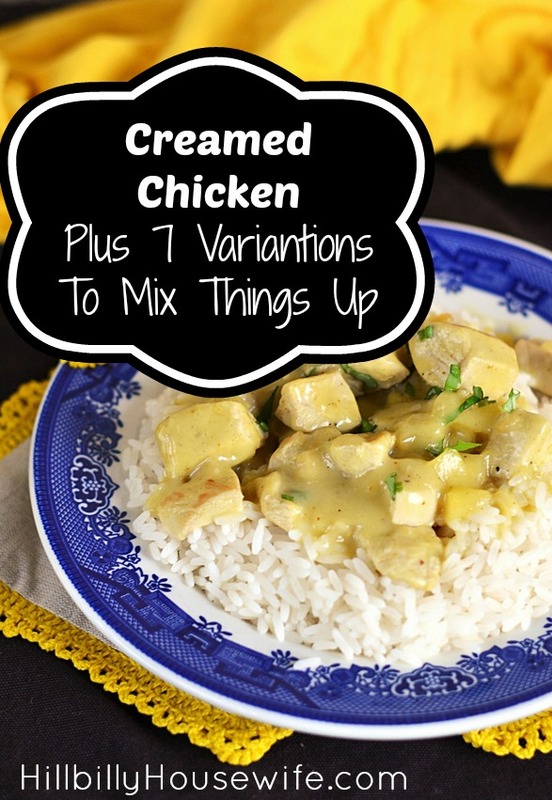 Creamed chicken is such an easy and versatile dish (as you’ll see in a minute). It’s a staple around here. I serve it plain over noodles, rice or toast. If you have some leftover veggies sitting in the fridge, add them to the mix toward the end. Or use one of the 7 variations of this basic recipe below. If you come up with your own variations, please share them as a comment below. And of course you can also make this with leftover turkey instead of chicken after the holidays. Melt the butter in a 3-quart sized saucepan. Add the onion and garlic and saute until the onions are tender and fragrant. Gradually add the chicken broth and milk. Cook and stir until the mixture boils. Boil for a full minute. Stir in the chicken and salt and pepper to taste. Cook and stir for a few more minutes to thoroughly heat the chicken and to blend the flavors. Serve over rice or biscuits or toast or noodles. This is only the beginning . . . .
Chicken Crepes: Prepare Creamed Chicken above. Also prepare a batch of Crepes. Use a slotted spoon to scoop up a good juicy lump of chicken from the sauce, and fill each crepe in turn. Some of the meat will stay in the sauce, but most of it will be rolled up in the crepes. Arrange the prepared crepes in a well oiled 9 by 13-inch pan. Drizzle all of the remaining sauce over top of them, and sprinkle with 1/2-cup shredded cheese. Bake at 400° for about 20 minutes, or until the cheese is nicely melted. Serve hot with a fruit salad and Brussels sprouts or green beans. Chicken A’la King: Prepare Creamed Chicken above. Sauté a chopped green pepper and 2-cups of sliced mushrooms along with the onions in step 1. If you don’t have a pepper, you can use a cup of canned or frozen peas instead. Add them in step 4. If you use canned mushrooms instead of fresh, then drain them well and add in step 4 too. Serve over popovers, or toast, or fresh biscuits. You can make this without the mushrooms if you don’t have any on hand. It won’t be authentic A’La King, but it will still taste very good. Chicken Pot Pie: Prepare Creamed Chicken above. In step 4 add 2-cups of leftover, canned, or frozen vegetables (slightly thawed). I like to add peas and carrots, but mixed vegetables or green beans and corn would be fine too. Simmer for a few minutes to heat the vegetables all the way through. While the sauce is cooking, prepare a double pie crust and line a large pie plate with the crust. Turn the prepared chicken and vegetable mixture into the crust. Arrange the top crust over the pan and crimp the edges to seal. Cut a few slits in the top to allow steam to escape. Bake at 400° for about 40 minutes, or until the top is brown. Serve hot with lots of green vegetables, and fresh fruit for dessert. Chicken with Biscuits: Prepare Creamed Chicken above. In step 4 add a pound of partially thawed, frozen mixed vegetables, or about 3-cups of cooked or well drained canned vegetables. Stir it all up and let it boil While the mixture cooks prepare a batch of drop biscuits by combining 2-1/2 cups of home made biscuit mix and a cup of milk. The dough will be very soft. Turn the boiling chicken and vegetable mixture into a well oiled 9 by 13-inch pan. Drop the biscuit dough on top of the hot mixture. Bake at 400° for about 20 minutes, or until the biscuits are golden brown. Serve hot with apple wedges, tall glasses of milk, and oatmeal raisin cookies for dessert. Chicken Tetrazzini: Prepare Creamed Chicken above. In step 1 add 2 cups of sliced mushrooms. If you want to use canned mushrooms instead, then drain them well and add in step 4. If desired, add a dash of wine or lemon juice or sherry in step 4 too. While this is cooking, boil up 6 to 8 ounces of spaghetti. When it is tender, drain it well and mix it with the creamed chicken mixture. Turn this into a well oiled 9″ by 13″ pan and sprinkle liberally with Parmesan Cheese. Bake at 350° for half an hour. Serve with spinach, butter-bread and orange sections. Chicken Divan: Prepare the Creamed Chicken above. If desired add a dash of wine or lemon juice or sherry in step 4. While the creamed chicken is cooking, steam or microwave a pound of fresh or frozen broccoli. Arrange the broccoli in a well oiled 9 by 13-inch pan. Pour the creamed chicken mixture over top of the broccoli. Sprinkle 1/2 to 1 cup of shredded cheese over top of the mixture. Bake at 400° for about 20 minutes, or until the cheese is melted and the sauce is bubbly. Serve with biscuits, muffins or noodles. Chicken Curry: In step 1 above cook 1-cup of sliced celery, 1 chopped apple (with the peel; red is pretty), and 2-teaspoons of curry powder along with the onion. Proceed as directed. Serve the chicken curry over rice. Accompaniments may be arranged in small bowls at the table. Choose from homemade yogurt, coconut, raisins, canned pineapple chunks, chopped peanuts, finely chopped boiled eggs, tart jelly, chopped pickles, and minced onions. Plain sugar cookies make the perfect dessert.